This trailhead sign is made in green and white and was most likely produced by the National Park Service. The sign is normally a single sided porcelain sign. 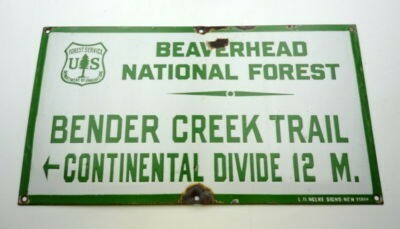 The text on the sign reads “Beaverhead National Forest, Bender Creek Trail, Continental Divide 12 M.” There is a small arrow pointing to the left.